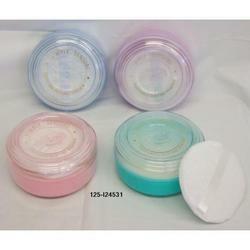 - Gentle puff for applying powder on baby skin. In order to retain our goodwill in this industry, we are providing a qualitative array of Baby Powder Puff. The bundle of the powder puff can be filled with soothing powder for easy application. The powder puff assures you complete safety and a fun filled experience for your little bundle of joy after a bath or a nappy change. Our organization is well known in the industry, engaged in offering a broad range of Powder Puff to our prestigious clients at reasonable prices. In addition, we provide this product in various packaging options. 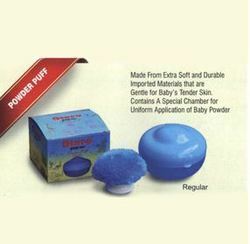 Being quality-centric firm, we are engaged in presenting a high-class range of Premium Baby Powder Puff. Our entity is involved in providing a comprehensive series of Powder Puff. Banking on our We are a top-notch organization, engaged in providing Baby Powder Puff. Our reputed entity is engaged in supplying Baby Powder Puff. These are the powder puffs for kids at the time of bathing.